We are constantly barraged with those claiming that low tax states have the best economies. And only slightly less so that getting a four year degree is no longer a path to prosperity, at least for those without a STEM degree. Neither are accurate. 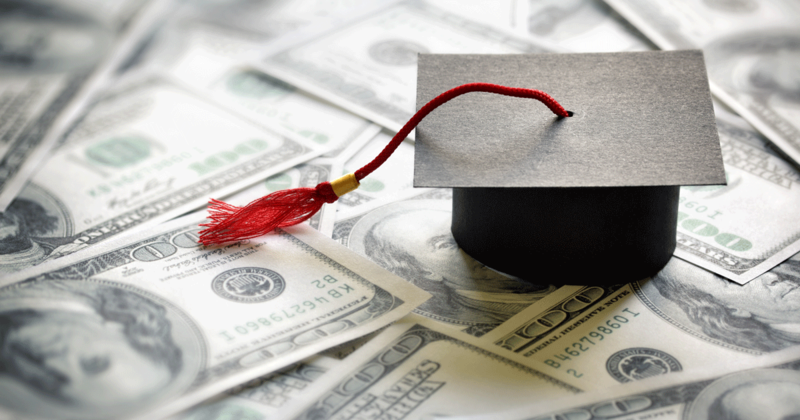 When it comes to determining which states are prosperous four year degree attainment is highly predictive of which states have high per capita income. As the table below depicts there are three states in the top 15 in per capita income that are energy-driven. 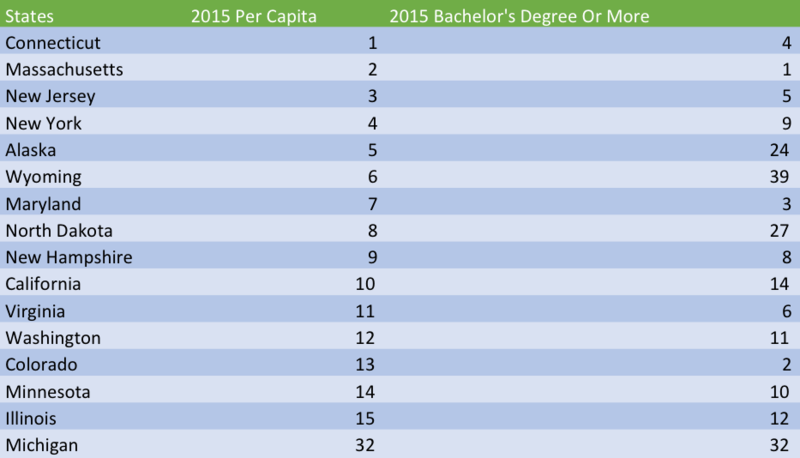 Of the other 12 all are in the top 15 in the proportion of adults with a four year degree or more. Source: Bureau of Economic Analysis, REIS. American Community Survey, Decennal Census. Accessed February 17, 2017. 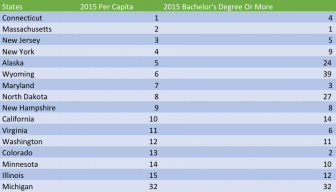 Michigan is 32nd in per capita income and 32nd is four year degree attainment. If the state doesn’t substantially increase the proportion of adults with a four year degree or more we almost certainly will be a low-prosperity state long term. End of story! What about low taxes as a path to prosperity. As we documented in our State Policies Matter report, Minnesota has the Great Lakes best economic outcomes and the highest taxes in the Great Lakes. They are third in the proportion of adults who work, 14th in per capita income and eighth in employment earnings (wages and employer paid benefits) per capita. Michigan on those measures ranks 40th, 32nd and 36th. So as our tax burden has gotten lower and lower Michigan has gotten poorer and poorer compared to the nation. Despite all evidence to the contrary, Michigan continues to have a tax-cut-driven economic development strategy. It hasn’t worked in the past, it almost certainly won’t work in the future. The new reality is that this is a human-capital-driven economy. Employers––particularly high wage employers––are locating where talent is concentrated. Its the asset that matters most to them. That means rather than low taxes, Michigan’s economic success strategy has to be preparing, retaining and attracting talent––particularly those with a four year degree or more.